The specs shared by the PS4's chief architect sound spiffy. You knew Sony was going to have to come out with some big guns at its highly anticipated press conference today in New York City. Within the first few minutes of the PlayStation Meeting presentation, Sony's executives called the new PlayStation 4 the most powerful gaming machine ever created. Mark Cerny - dubbed the chief system architect - took the stage next and outlined some of the capabilities of Sony's new platform like the DualShock 4 controller and the console's "supercharged PC architecture." Cerny said every console up to this point was intended to be a game console first, but that the network possibilities have changed all that. 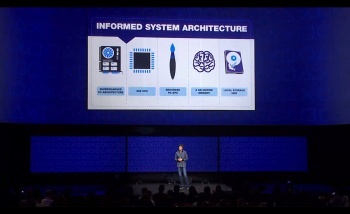 PS4 was designed from the ground up to do as much as possible in the cloud, and Cerny spoke to developers to make that possible when building the architecture. "Our goal was to create an architecture that would facilitate the expression of their ideas," he said. After all the buzzwords and promises, he got a bit technical, but not in a bad way. The CPU for the PS4 is a x86 chip and it's teamed up with an unnamed "highly enhanced PC GPU". There's 8 gb of "unified high speed memory" or GDDR5 RAM and the system's memory is backed by massive local storage. Cerny didn't say how big the HD would be, but given everything else we've heard, I expect it to be pretty big. That's not all. Cerny demoed a bit of a game running the Unreal Engine 4 and boasted it could handle nearly 2 teraflops of computational power. In case you're wondering, a teraflop is defined as "one trillion floating point operations per second" or - in laymen's terms - a metric crapton of calculations. Add all that power in with the broadcast streaming capabilities, the actual game demo streaming from the PlayStation store and the nifty new controller, and the integrated social play Sony talked about later in the presser, and so far it looks like the PS4 promises quite a bit.